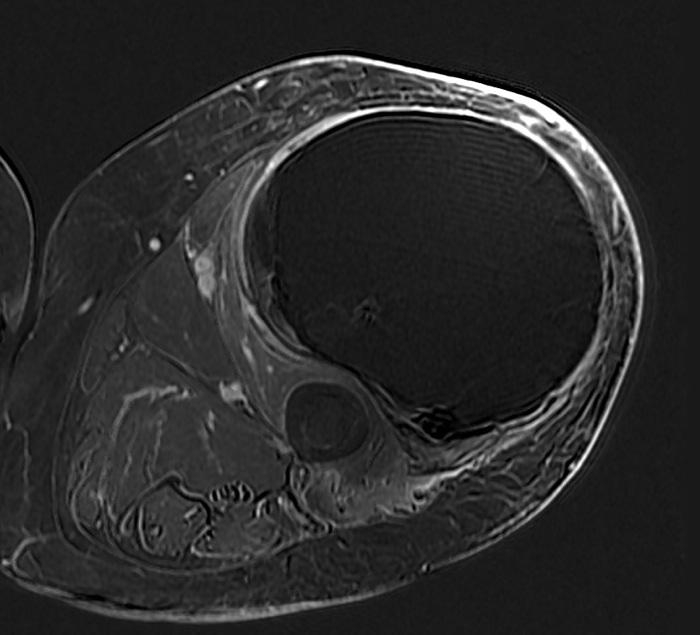 This 62 year old man presented with thigh pain and swelling. 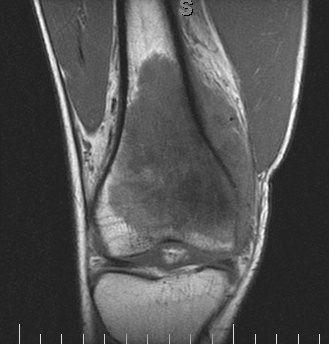 MRI imaging showed a large mass within the quadriceps muscle (vastus lateralis). Biopsy was performed at the time of initial evaluation and confirmed a high grade undifferentiated sarcoma. 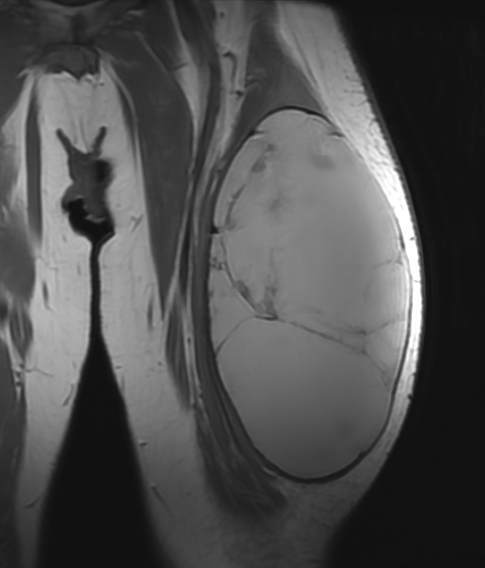 The tumor was localized to the thigh (Stage III). The next two images above show the extent of the tumor at the time of surgery. The last image demonstrates how most of the mass is fluid and blood, as the large bulk of the mass does not take up contrast and remains dark. 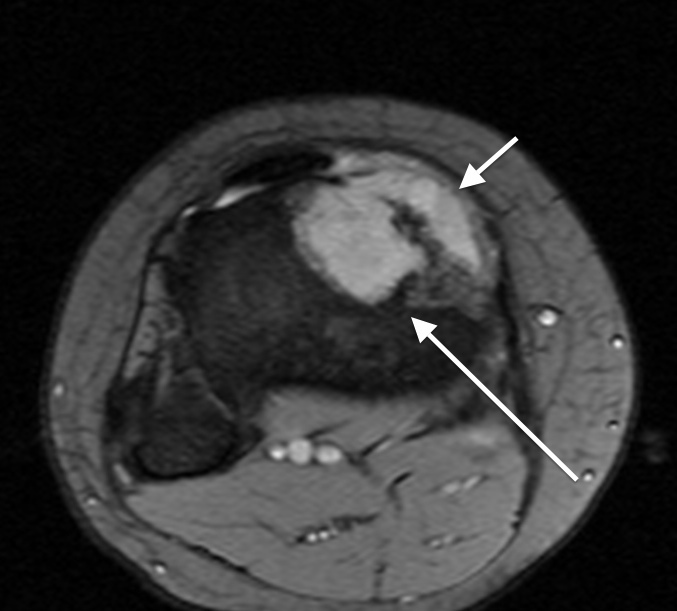 Surgery involved exposing the affected portion of the quadriceps (first image below) and removing the tumor with surrounding layer of intact muscle (second image). 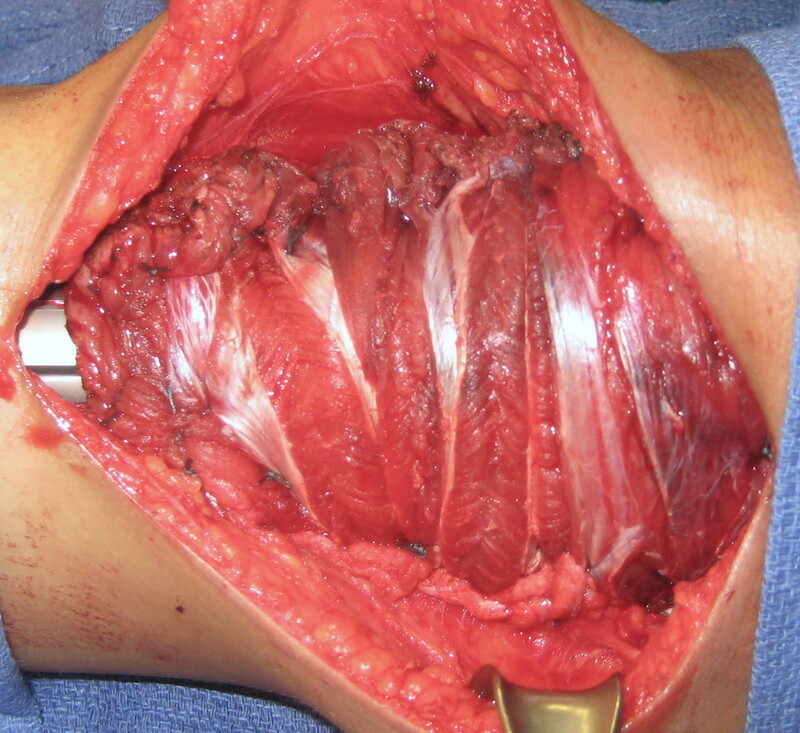 The remaining portions of the quadriceps were then sutured together (third image). 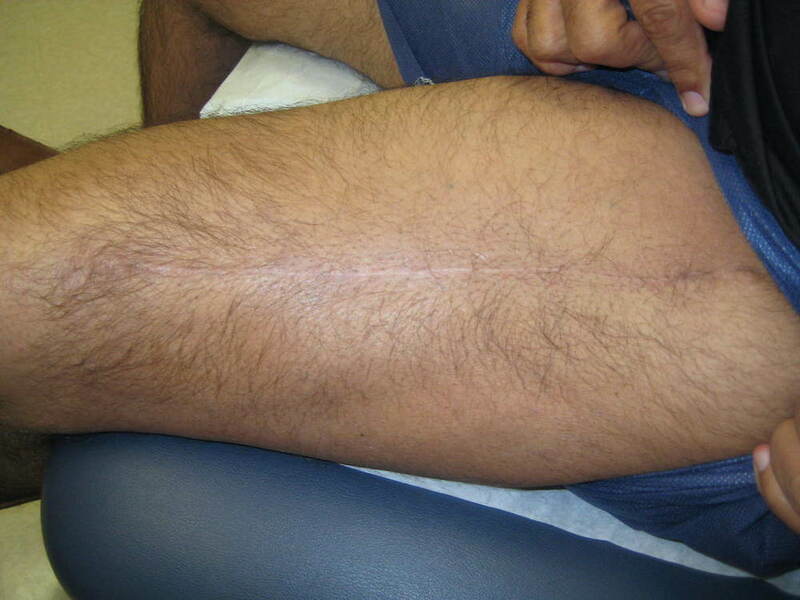 The final image shows the healed thigh incision nine months later. Nine months later he returns, reporting no pain and regularly walking up to 2-3 miles for exercise. 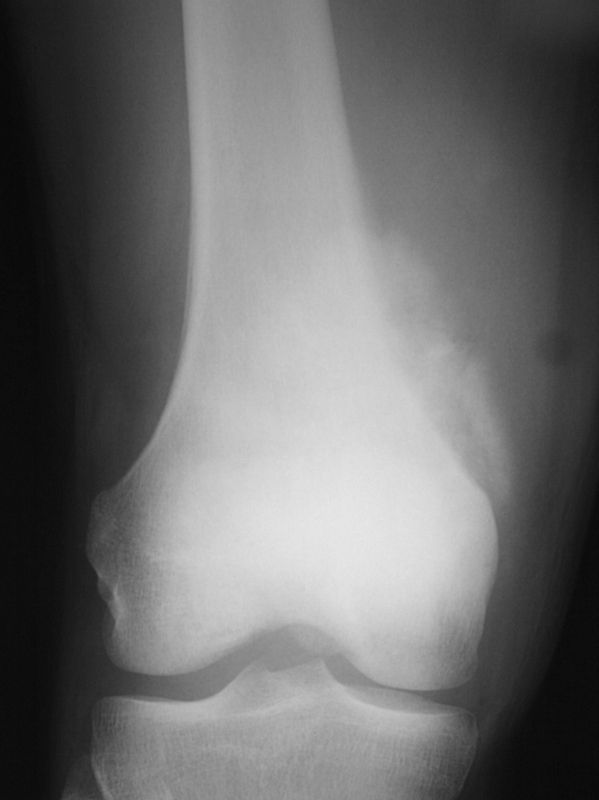 This 17 year old girl presented with several months of gradually worsening knee pain. 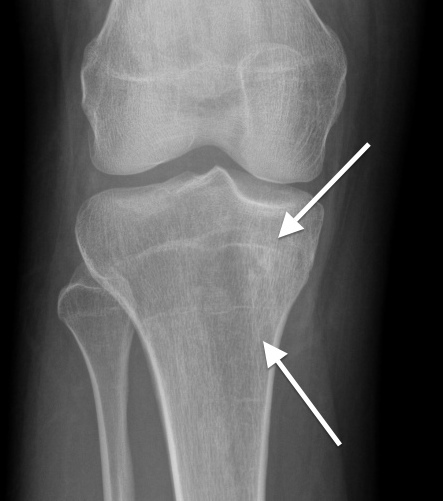 The first image is the initial X-ray where there is subtle increased density inside the top portion of the tibia (arrows). The second image is the initial MRI, where the tumor is more obvious, replacing the marrow (long arrow) and also breaking out of the bone (short arrow). Image guided biopsy confirmed osteosarcoma. CT scans of her lungs and other studies showed the tumor was localized to the bone only (Stage IIa). The patient then started chemotherapy and about 3 months later was ready for surgery. The next two images show the initial portion of her surgery. This consisted of exposing the proximal portion of the tibia (third image), leaving a layer of muscle and tissue covering the area where the tumor had extruded from the bone (two arrows). 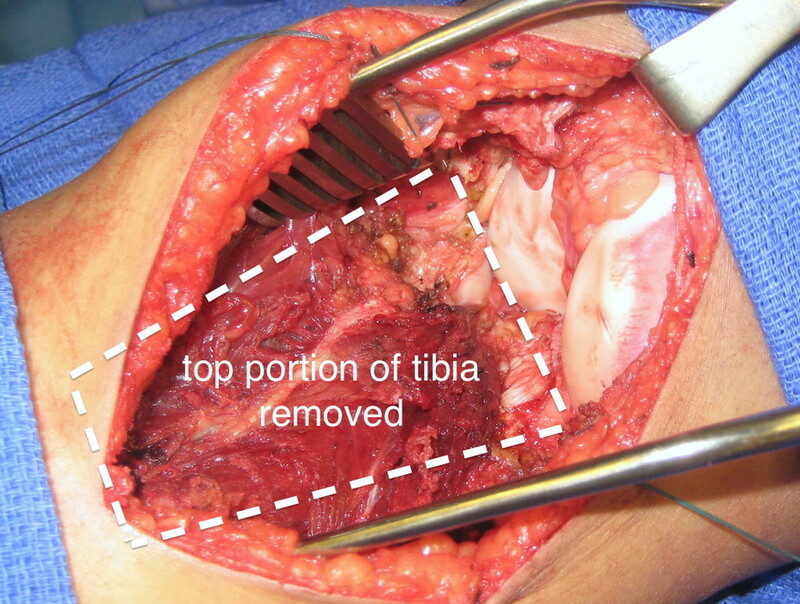 The last image shows the knee region after the entire proximal tibia was removed. 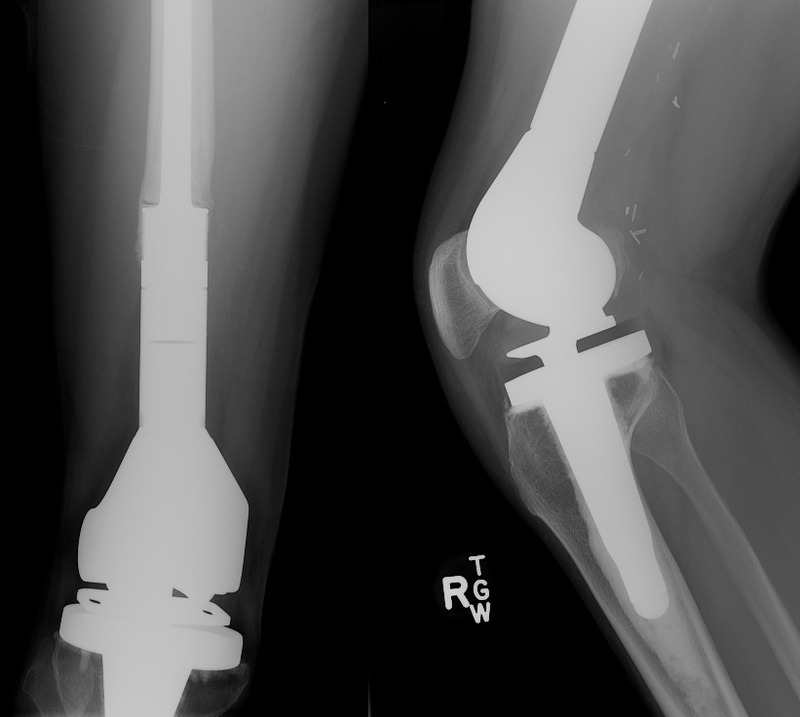 Once the bone is removed, a "trial" implant is assembled to match the size of the removed portion of tibia (first image below). This is tested inside the patient for correct fit. 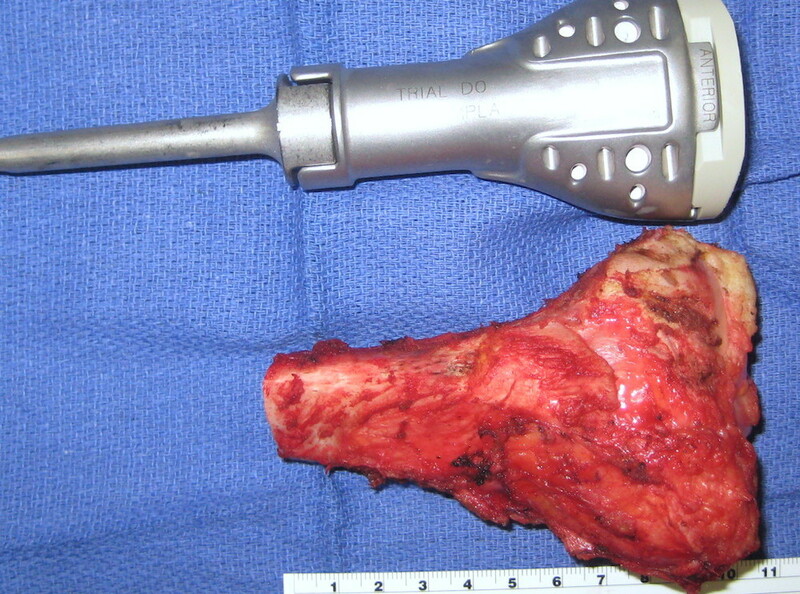 Then, the actual implant is assembled and inserted into the both the femur and tibia (second picture). When reconstructing the proximal tibia, it is critical that the thigh muscles (quadriceps) are reconnected to the proximal tibia so that the patient can actively extend the knee and walk properly. Since the original tendon connection is removed along with the tibia, we use a portion of the calf muscles ("medial gastrocnemius") to bridge the two areas (third picture below). The final X-ray is shown on the right. Two year later, she walks with a barely perceptible gait abnormality. She is attending college and reports no pain when walking. A video is below. This 18 year old boy had pain in his knee that was not going away over a period of months. Eventually X-rays were done (first image on the left) which show the hallmark findings of osteosarcoma. As seen more closely on the second image, there is a mass adjacent the bone which is calcified. This is almost definitive for osteosarcoma. 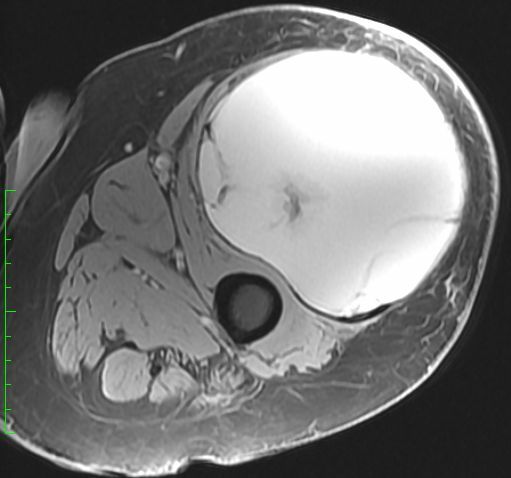 The last two are MRI images showing the tumor extending up and outside the femur. His tumor was localized to the femur (Stage IIb). After biopsy confirmed osteosarcoma, he was begun on standard chemotherapy. The total duration of chemotherapy is about nine months. Surgery is typically done three months into therapy. The images below show the surgical procedure. 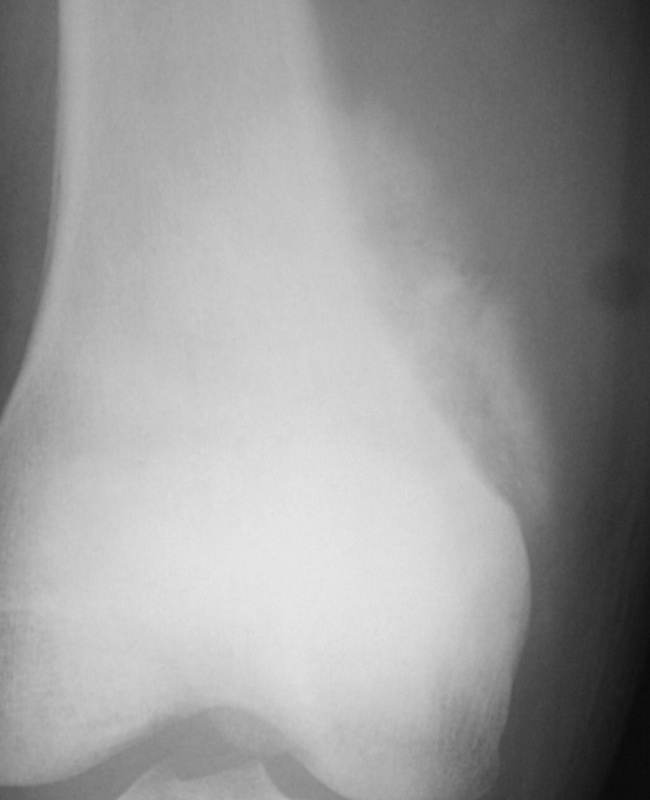 In the first, the knee region has been exposed and the distal portion of the femur already removed. 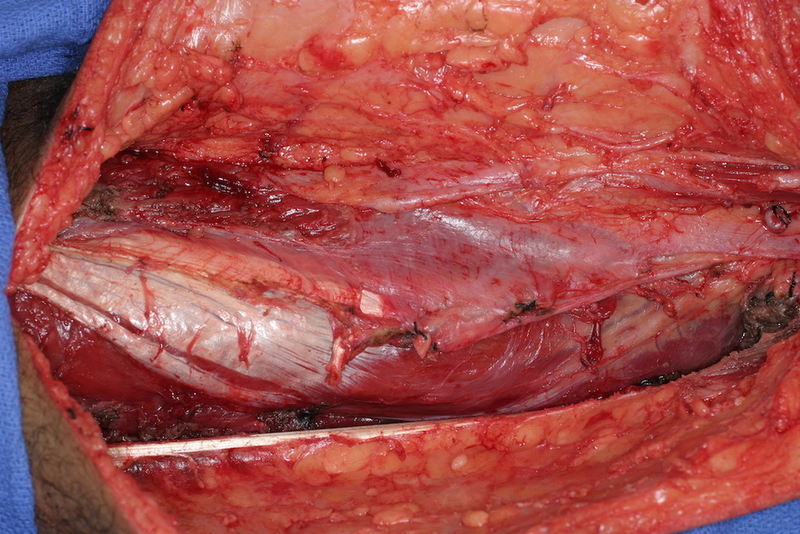 The large rubber band is encircling and protecting the large blood vessels found behind the femur. 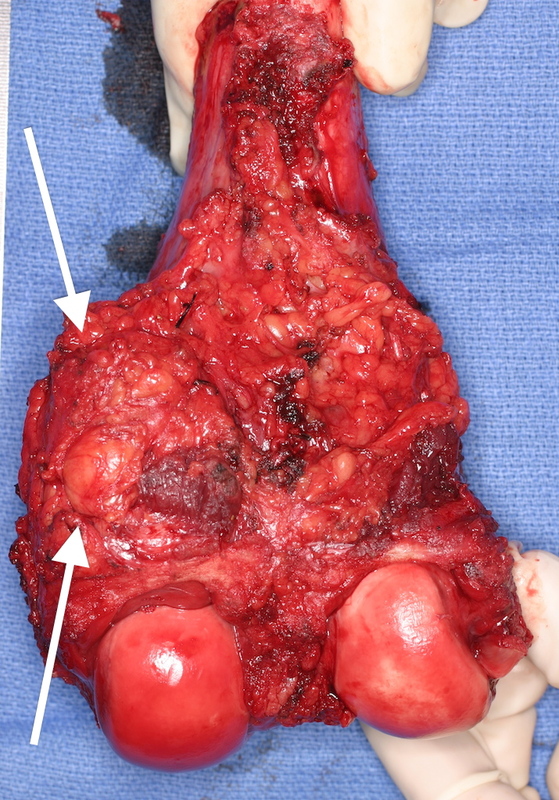 The second image shows the removed bone, with a layer of muscle and tissue covering the portion where the tumor had protruded outside the bone. 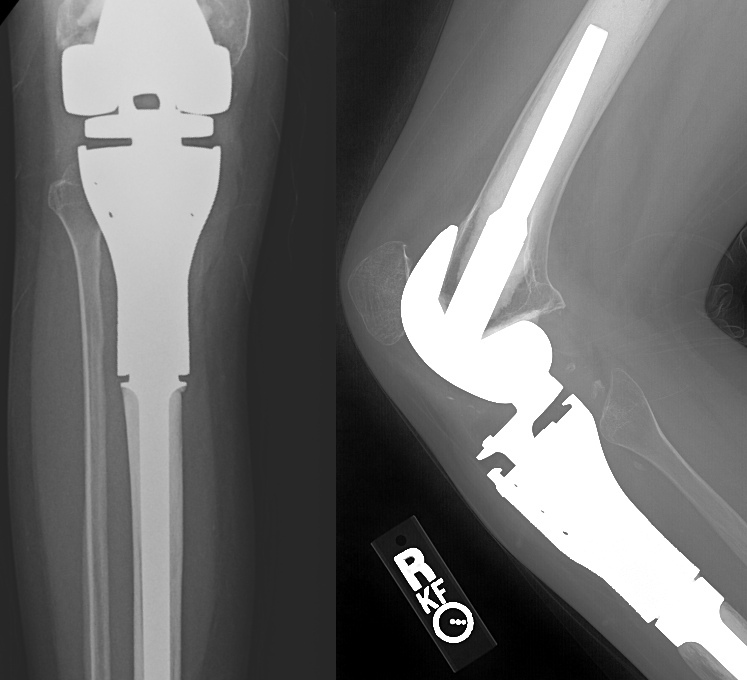 The third image below shows the assembled prosthesis already implanted into the femur and tibia. 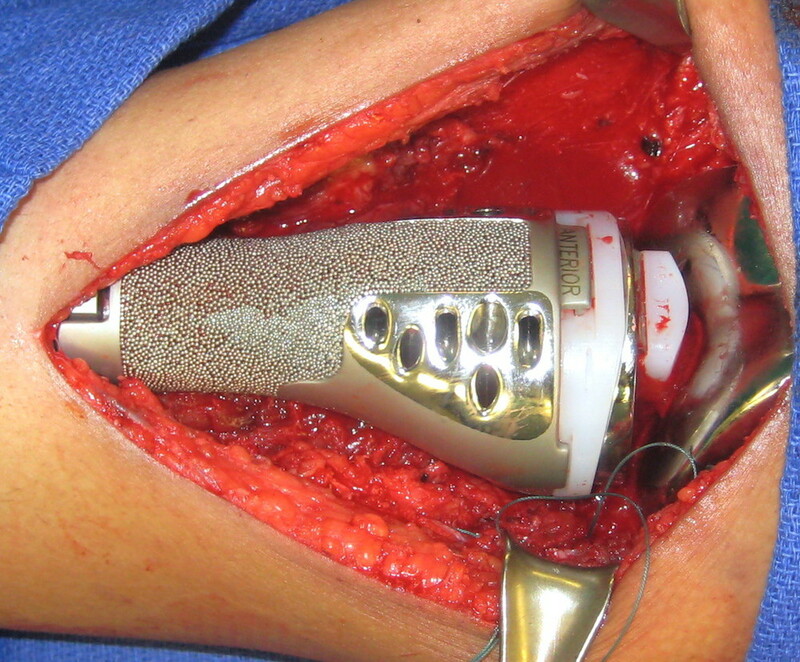 To better mimic the natural movements of the knee, this type of implant allows for both flexion and rotation of the joint through the (white) plastic components. The last image is the X-ray showing the implant inside the patient. Seven years later, the now young man has finished college and is working full time. He does not think too often about his artificial knee and walks normally, as can be seen in the video below.